Origin and Habitat: Mammillaria roseoalba is a poorly known plant endemic to Mexico, occurring in the states of Tamaulipas, San Luis Potosí, Nuevo León and Coahuila. Altitude range: 720 to 1,800 metres above sea level (Pilbeam 1999). Habitat and Ecology: This specie grows in xerophytic shrublands together with Mammillaria sphaerica, Mammillaria baumii, Mammillaria rubrograndis, Obregonia denegrii, Ritterocereus pruinosus, Ferocactus victoriensis, Myrtillocactus geometrizans, Pilosocereus palmeri and Echinocereus viereckii. There is no information available on the threats. Description: Mammillaria roseoalba is a small depressed globose cactus, densely covered with thin, white-brown spines, easily broken. The small, whitish flowers are followed by masses of bright red fruits that contrast nicely with the spination. 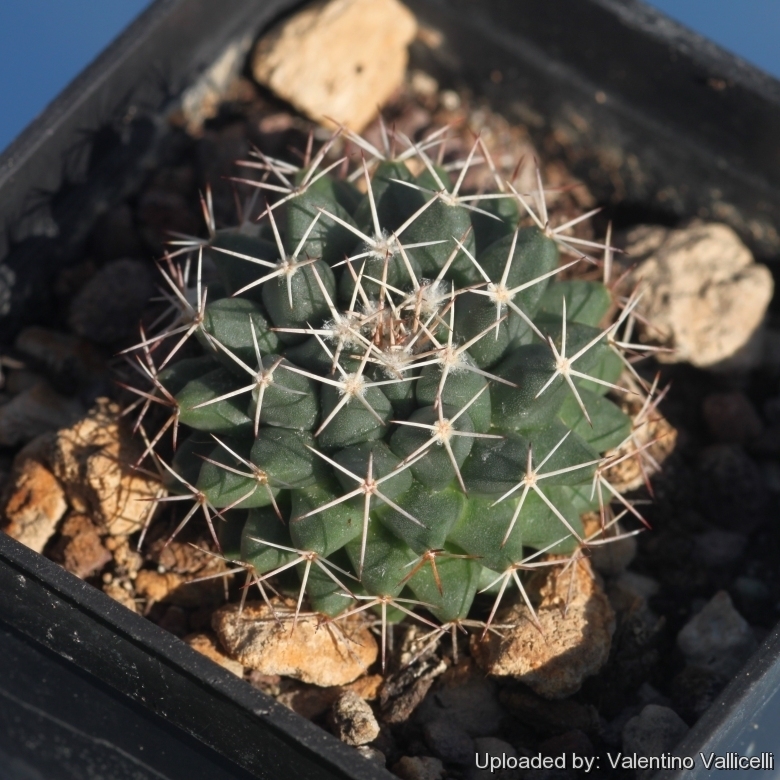 Very little is known about Mammillaria roseoalba, there are doubts about the accuracy of its distribution range and about its taxonomic distinctness. Some people consider this species to be conspecific with Mammillaria heyderi. The species is used as an ornamental and there is increased commercial propagation, however, whether the plants sold under this name are in fact this species or not is debateable. Stems: Flattened globose, to 6 cm high, 8-10(-18) cm in diameter. Tubercles: Pyramidal, dorsally flattened and distinctly angled, keeled, bluish up to 8 mm in diameter at the base, arranged in 8 and 13 spiral, with latex, axils densely woolly. Areoles: Up to 3 mm across, woolly at first, later naked. Radial spines: 4-5, rarely 6, slightly curved, unequal, needle-like, 1-2 upper ones smaller and less sub-central, the upper and lower ones whitish to brown-black, the laterals whitish with pink bases and black tips, 5 to 8 mm long. All straight, thin acicular or subulate, extended horizontally something ascending. Flowers: Campanulate, whitish, to 15-30 mm long and in diameter. Outer perianth segments, lanceolate with acuminate tip, midline greenish or pinkish brown, margins ivory and hairy. Inner perianth segments to 20 mm long and 2 mm wide white to pale pink, linear with margin entire, tip acuminate. Filaments pink-white, anthers pink, stigma lobes 5-7 green-yellow. Fruits: Club shaped, somewhat recurved, red, to 15 mm long. 2) Fitz Maurice, B, Fitz Maurice, W.A., Hernández, H.M. & Sotomayor, M. 2013. Mammillaria roseoalba. The IUCN Red List of Threatened Species 2013: e.T152043A590516. http://dx.doi.org/10.2305/IUCN.UK.2013-1.RLTS.T152043A590516.en . Downloaded on 22 October 2015. 4) Ulises Guzmán, Salvador Arias, Patricia Dávila “Catálogo de cactáceas mexicanas”. Universidad Nacional Autónoma de México, Mexiko-Stadt 2003. 7) John Pilbeam “Mammillaria The Cactus File Handbook” Nuffield Press. 1999.